Recently, I went to play badminton with drop-in group I had never met before. I was invited by a friend who wanted me to experience for myself just how slippery the floors were in the high school gym the group called home. In fact, he was so concerned about the floors that he wanted me (as a coach) to write a letter to the school board regarding the danger to athletes forced to compete in such conditions. In all there were 17 players present on the night I visited. Looking around the gym about 30 minutes into the session, I saw two players in Nike running shoes and 15 in court shoes. Of the 15 wearing court shoes, two were wearing tennis shoes and five were wearing Mizuno volleyball shoes with synthetic rubber heels. The remaining eight were wearing indoor court shoes suitable for badminton. 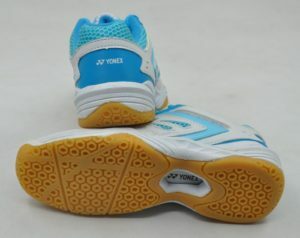 Of these eight, five pair were models that Yonex ™ stopped selling three to five years ago, two were new budget models and one — only one pair of shoes on the 17 players present — was a new model from the recreational category. Halfway through the two hour session, my friend stopped play so he could formally introduce me and explain that I was there to examine the floor and potentially write a letter to the school board on the group’s behalf. The first thing I did was ask for a show of hands. “How many people are slipping and sliding?” I asked. Almost every hand in the room shot up. “OK. How many people are not having problems?” Down went 15 arms and only two went up. One was the guy in the recreational grade badminton shoes and the other was a young lady in new budget grade shoes. Without explanation, I divided the players into two groups. I put the two players with new shoes on one side of a badminton net and everybody else on the other. Then we did a little test. I asked the large group to show me how slippery the floor was. They obliged and made it clear that they were unable to maintain traction over most of the floor on their side of the court. Then I asked the two players on the other side of the net to slip and slide around the floor on their side of the court. Of course, they could not. “No fair,” said one of the slip-n-sliders, “That side of the room has more traction because this side of the room has the doors and benches.” OK. Fair enough. I told the groups to change sides and we repeated the experiment. The young lady with the budget shoes was able to slide a little, but the guy with the recreational grade shoes had full traction of this side just as he had on the other. To complete my demonstration, I asked my friend (one of the slip-n-sliders) and the guy with traction to remove their shoes. I then got down on my knees with one of their shoes in each hand. Pushing down and forward, I showed them how the worn out shoe in my left hand was able to slide across the surface while the shoe in my right hand refused to slide at all. I then invited the players to try it themselves and several did. While they were doing that, I went to my bag and took out a new pair of recreational grade badminton shoes and asked my friend to put them on. Once they were correctly tied to his feet, I asked him to demonstrate once again how bad to floor was in the gymnasium. Of course, he could not, because there was nothing wrong with the floor in the first place. The most important feature of athletic shoes is traction. It’s not style. It’s not colour. It’s not price. It’s traction first. Fit second — and everything else is last. If you do not have proper traction, you will not play well, you will not be safe and you will expose yourself to injury. Buy good shoes with maximum traction and take care of them. Budget shoes are suitable for players who expect to outgrow them before they wear out. They are also suitable for players who will only need them for one session. Be aware, though, that budget shoes are a false economy. While they may cost 20-30% less than recreational grade shoes, they last half as long or less. So if you are a semi-frequent player, you will be buying budget shoes twice as often as recreational grade shoes because the traction they give you will be short-lived at best. If you take care of recreational or competitive grade badminton shoes, you may get two full seasons out of them. But beware. Even the best organic rubber dries out over time. So you will have to replace your badminton shoes regularly, even if you don’t wear them, even if you take perfect care of them. Traction should be your guide. Once it’s gone, your shoes are done. Regardless of how much you paid for them, regardless of how much you like them, once the traction is gone, it’s time to replace them.